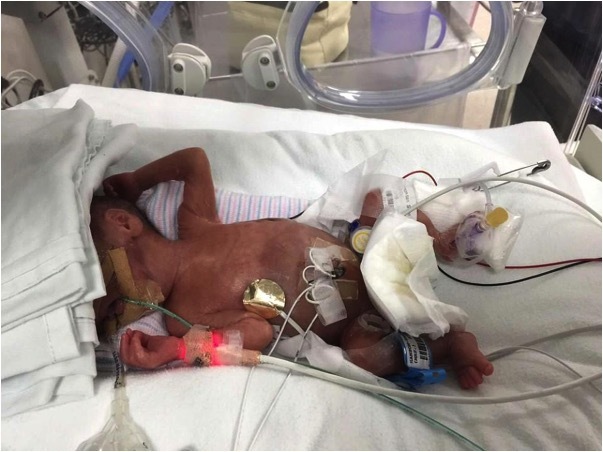 In the January edition of our Preemie Family newsletter we learned about 24-week preemie Oliver Shan Yu Hanson who was born at 1 lb. 4 oz. and spent 201 days in the NICU before coming home. 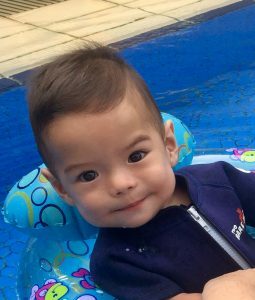 Read more in an update by his mother, Soo Lin Tan. November 1st 2015 was not a happy day. There was no nervous jubilation at the anticipation of a new life into our family. There was fear and only fear. My second pregnancy at 40 was one fraught with difficulties from the very beginning. By 14 weeks, I was bleeding and my blood pressure was steadily climbing. I was put on medication and monitored closely by both my cardiologist and gynaecologist. By the time I was 23 weeks, the doctors could no longer hold my preeclampsia at bay. By then, the baby had also stopped growing due to IUGR (Intrauterine Growth Restriction). I was admitted to the hospital on a Wednesday, and by Friday, a team of doctors and counsellors came into the labour ward to inform me that I have to deliver the baby via emergency C-section as both baby and I were in a critical condition. By then, my bp was 230/170. All my husband and I felt was pure terror as I was wheeled into surgery. Our son, Oliver Shan Yu Hanson was born on November 1st 2015 at 1751hrs, 1 pound 4 ounces and 10 inches long. I only saw him on the 3rd day in person because I too was still in a critical condition and not allowed out of my bed so I’ve only seen him in the photos taken by my husband. That did not prepare me for the shock I’d get when I first saw him. Honestly, I almost fainted. I could not imagine a baby could look like this. Not only was he tiny, he was almost flat. There were harsh needles and tubes all over his tiny bruised body. My husband and I were utterly heartbroken and the fearful wait began. The next two months in the NICU was a harrowing period. Oli had many touch and go moments – he had 3 lung collapses, a pda ligation (frontal cut, because his lungs were too fragile for him to be on his side), multiple infections and 15 blood transfusions. He was on the High Frequency Oscillatory Ventilation machine for a whopping 124 days (the longest in the NICU history) and we were only able to hold him for the first time after he was extubated, 4 months after he was born. Subsequently, he was put on 3 different types of assisted ventilation and underwent multiple courses of steroid treatments due to his severe chronic lung disease. Through it all, husband and I tried to put on a brave front but there were so many times at night when we would totally break down in heartbreak and fear over what was happening to our baby boy. We would have discussions about when would be considered Oli’s birthday – his EDD or the day he would get discharged because we hated November 1st and were anguished over how our boy was born. Oli finally came home after 201 days in the NICU on oxygen support with 2L flow on the oxygen concentrator. In the 5 months since he has been home, Oli is slowly gaining strides, growing and developing at his own pace. We can feel the fear ebbing away as we watch our son grow from strength to strength. I no longer panic at a sneeze or a cough. On November 1st 2016, his first birthday, Oli was weaned off oxygen completely! There was so much joy and gratitude as we come to embrace November 1st as the day our brave boy made his mighty presence and strength known to us. At one, Oli is lively and happy. He has no ROP, no brain damage, and no hearing issue and other than being small in size, is like a normal baby exploring the world. We are forever grateful to the wonderful and dedicated team of doctors and nurses who looked after our son so well in the NICU. Thank you Soo Lin for sharing your family story with us. Oliver’s story inspires hope – something we all need. Your family will remain in my thoughts and prayers.